Lahar, the cold volcanic debris flowing down the slopes of Mount Merapi, is not only threatening houses and infrastructure but also archeological sites, a geologist said on Tuesday. Subandrio, head of the Volcano Investigation and Technology Development Institution (BPPTK), said a team of geologists and archaeologists was evaluating the physical condition of temples located near the paths of the lahar runoff from Merapi. â€œAccording to a letter from the Archaeological Heritage Conservation Center of Central Java, we have to give particular attention to the safety of Prambanan Temple and other temples in the complex,â€ he said. 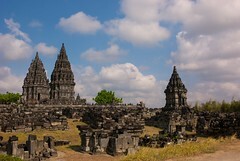 Prambanan is a ninth century Hindu temple complex and a Unesco World Heritage site. The Archaeological Heritage Conservation Center (BPPP) has asked the BPPTK to carefully monitor lahar flows near the temples. Three geophones, which can detect vibrations caused by lava flows, have been put in place as an early warning system.